Location: The Domaine de Montcy is located in a "Lieu dit" ("a place known as" in English) called "Voie de la Porte Dorée" (or "Porte Dorée"), about 4 kms to the southwest on the out skirt of Cheverny. A small village of the eastern Loire Valley, about 16 kilometers southeast of Blois and 80 kilometers east of Tours. History: Born in Italy about 40 years ago, Laura Semeria, who followed the steps of her French husband Léonard across France to finally stop near the Loire River, now owns Domaine de Montcy. Her family has been making olive oil and Mediterranean products for three generations and she has always been acquainted with agriculture. She made her entire career in multinational food companies such as Unilever and Nestle. Dreaming to buy a wine estate and after months of searching in vain in Italy, it is, after all, the small appellation of Cheverny that opened its arms to her. She found an estate for sale with a very welcoming owner and a promising vineyard, and decided to buy it. This new acquisition allowed her to settle down in Cheverny, near the Château de Troussay of which the Domaine de Montcy now manages the old vines and the ancient vineyards of the Château. The team: Laura supervises the estate and production while her husband, when is not helping her, is making cheese, which makes a lot of sense with wines! And they have two young daughters Ines and Elsa. The winemaker is a young brilliant and passionate agro-engineer who is able to take (reasonable!) risks to make the best out of our terroir. Additionally, they still have the support of their predecessor (that was also part of the deal). Vineyard Management: Since 2005, Domaine de Montcy's vineyards management is under "agriculture raisonnée" (or sustainable culture, with an organic approach), a system of durable agriculture concerned and respectful of its environment (soils, vines, plants, herbs, insects, etc..), to produce better and more natural wines from carefully attended vines resulting in higher quality grapes. The cellar is also equipped with state of the art vinification tools allowing minimal intervention to craft more authentic wines. Size and Production: The only objective of the Domaine is that the 120.000 bottles sold each year, out of the 20 hectares in production, offer the best characteristics of their Terroir, grape variety and climate of origin. 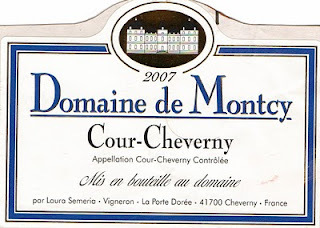 Producing wines from both Appellations, Domaine de Montcy crafts some excellent Cheverny wines in red, white and rosé, as well as a great "Sauvignon Blanc VdP du Jardin de la France" and interesting sparkling "Crémant de Loire - Méthode Traditionnelle", and their benchmark Cour-Cheverny and Cour-Cheverny Cuvée Claude de France. Vines and vineyards: The 20 hectares are divided as follow: 3ha of Romorantin, 9ha of white grapes varieties (7 Sauvignon and 2 Chardonnay) and 8ha of red grapes varieties (4 Pinot Noir, 3 Gamay, 0.5 Malbec - also called Cot in Loire Valley and 0.5 Cabernet Sauvignon- for Rosé). The vines are from 3 to 100 years old. Each year, they replant new vineyards to increase vineyard’s superficy and to replace some old parcels. The oldest parcel is a small (0,5ha) piece of land of Romorantin, which was planted in 1905. They also have an old parcel of Sauvignon (about 60 years old) and old Chardonnay (40 years old). Red vines are younger because they had to replant higher quality varieties. During harvest, old and young vines’ grape varieties are respectively vinified and aged separately. The final blends usually occur just before bottling the different wines. 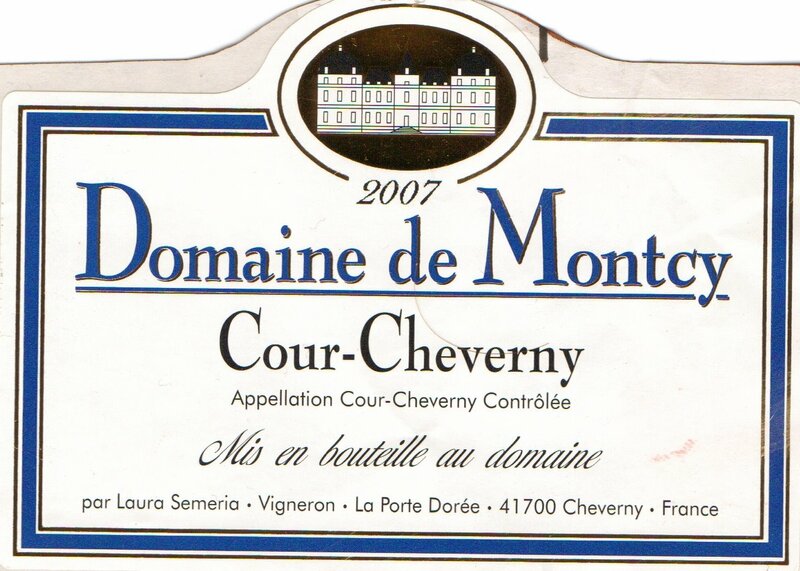 Vinification: Issued from their best vineyards in Cheverny, and Cour-Cheverny, Domaine de Montcy also applies rigorous parcel selections of their vineyards and hand harvest with successive sortings to pick the grapes at ideal fruit ripeness and phenolic maturity. Under "culture raisonnée" (or sustainable culture), the vinification and ageing processes are natural and particularly adapted to each batch of grapes, with indigenous yeast and no use of any industrial yeasts or enzymes. Hygiene conditions are maximal in the cellar, which allow for minimum use of SO2 (Sulfur Dioxide) and fuller flavor expressions. Domaine de Montcy uses all the grape varieties allowed by the Appellations rules: Chardonnay, Chenin Blanc and Arbois for the whites and Cabernet Franc, Gamay, Pinot Noir and cot for the Reds. Made from 80% Sauvignon Blanc and 20% Chardonnay from vines planted on Clay-Siliceous soils (blend may change depending on the vintage and quality of the grapes, i.e. 2007 was 85% Sauvignon Blanc and 15% Chardonnay. This goes for all the wines.). After careful selection during the harvest and gentle pressing for 4 hours at very low pressure to extract only the best aromas, the musts deposited sediment for 48hours in underground tanks at 8°C and were protected against oxygen by carbon dioxide. The fermentation occurred naturally without any addition of yeasts or enzymes to allow maximum expression of the Terroir of origin, and with minimal use of SO2. The musts were pumped with finest lees in tanks and alcoholic fermentation started with natural yeast when temperature reached 16°C. Then, fermentation temperature was kept between 16 and 18°C to preserve aromas. Because of natural yeasts this fermentation can last from 1 week to 3 months. Once the alcoholic fermentation is finish, the wines are pumped into different tanks, with no addition of sulphites at this stage. Depending on the vintage and the desired final style, the malolactic fermentations are usually made on the Chardonnay and on 50% of Sauvignon with natural bacteria. The wines rest for 6 months on fine lees in their tanks. Sauvignon and Chardonnay are usually blended in April and bottled with low quantity of sulphites (30mg/L). Produced in stainless steel tanks where it spends about 6 months on its lees before bottling, this white Cheverny wine combines the elegance and complexity of Cheverny’s Terroir. Behind its pale yellow-gold color, the nose is floral with white fruit aromas. The palate is clean, dry and generous, well rounded and complex with refreshing acidity. The lingering finish is balanced and inviting. Great as an aperitif, it will pair well with white fish and goat cheese. Serve it cool but not too cold. Drink it now or keep it for the next 2-3 years. Made from 65% Gamay, 30% Pinot noir and 5% Côt from vines planted on Clay-Siliceous soils (blend may change depending on the vintage and quality of the grapes, i.e. 2007 was 62% Gamay, 31% Pinot Noir and 7% Côt. This goes for all the wines.). After careful selection during the harvest and gentle pressing, the fermentation occurs naturally without any addition of yeasts or enzymes to allow maximum expression of the Terroir of origin, and with minimal use of SO2. Produced in stainless steel tanks where it spends a few months on its lees before bottling, this red Cheverny wine combines the character and complexity of Cheverny’s Terroir. Pinot Noir can be vinified in two ways: half with Cold pre-fermenting fermentation and half with hot temperature fermentation. For the first way, grapes are kept at 8°C for 8 days with many pumping over to extract a lot of cherry tastes and a nice red color. Then alcoholic fermentation occurred very quickly (about 5 days) at 25°C. For the second way, temperatures were increased up to 30°C at the beginning and pumped-over were made during the alcoholic fermentation in order to extract tannins. A third of the grapes were put entirely into the tank to extract tannins from the grapes. Gamay is usually vinified at medium temperature between 25 and 27°C and maceration can last about 8 days. The amount of pump-over, which was important at the beginning of the fermentation slowly, decreases to avoid the extraction of too many types of tannin. Côt is fermented for only 5 days to keep tannins soft and color on a dark pink. After alcoholic fermentation, each grape variety underwent malolactic fermentation in separated tank and was aged separately for 12 months. The final wine is usually bottled in September with low sulphites (28 mg/L). Red garnet color, the nose is intense with red fruits and berries and slight spicy notes. The palate is expressive with great red fruit intensity. The finish is quite generous, vivid and balanced with silky integrated tannins that characterize well the Terroir of Cheverny. Perfect with grilled chicken and appetizers, like the white and served slightly chilled, it is also delightful with fish (especially if prepared with diced tomatoes and capers). Drink it now or keep it for the next 3-4 years. Made from 60% Gamay, 23% Pinot noir and 17% Cabernet Franc from vines planted on Clay-Siliceous soils. After careful selection during the harvest and gentle pressing, the fermentation occurs naturally without any addition of yeasts or enzymes to allow maximum expression of the Terroir of origin, and with minimal use of SO2. Produced in stainless steel tanks, this Cheverny Rosé was crafted not by Saignée but from direct pressing which confered to this wine all the character of the vintage. Bright Pink rosé hue with slightly orange reflects, the nose is vivid and very expressive, marked with raspberry notes. The palate is crisp and refreshing with mixed berry fruit flavors lifted by an enhancing acidity. The finish is supple and friendly. Thirst quencher as an aperitif, it is ideal with steamed fish, salad and barbecue. Drink it within 2 years maximum after bottling. Made from 50-50% old vines Sauvignon Blanc and Chardonnay planted on siliceous soils with yellow clay and flint stones. After careful selection during the harvest and gentle pressing, the fermentation occurs naturally without any addition of yeasts or enzymes to allow maximum expression of the Terroir of origin, and with minimal use of SO2. Produced in stainless steel tanks where it spends a few months on its lees before bottling, this white Cheverny wine combines the elegance and complexity of Cheverny’s Terroir with the structure and characteristics of the old vines. Yellow color with golden reflects, the nose is gentle and discreet with acacia and mineral notes. The palate is rich yet elegant, balanced and beautifully structured with enhancing minerality. The lingering finish is ample and round marked by the Chardonnay. Pair it with crabs, lobster, oysters, fish in sauce and white meat but also with various cheeses. Better decanted, it will need a bit of air to fully express its complexity. Drink it now or keep it for another 4-5 years. Made from 65% Pinot Noir, 20% Gamay and 15% Côt planted on Calcareous-Clay soils. After careful selection during the harvest and gentle pressing, the fermentation occurs naturally without any addition of yeasts or enzymes to allow maximum expression of the Terroir of origin, and with minimal use of SO2. Produced in stainless steel tanks where it spends a few months on its lees before bottling, this red Cheverny wine combines the elegance and complexity of the calcareous Terroir with the structure and characteristics of the old vines. Bright ruby red color, the nose is quite intense with spicy red cherry aromas typical of Pinot noir, expanding gently with more red fruits and pepper. The palate is balanced, elegant and racy, with ripe red fruits flavors structured by silky tannins and enhancing acidity. The lingering finish is underlined by the presence of the tannins from the Côt grape. It is an elegant and silky red wine of great profile to pair with earthy dishes like game and venison. Drink it now, decant it for better result or keep it for another 5-7 years. Coming from the village next door, literally a stone’s throw north of Cheverny, this Cour-Cheverny was crafted with 100% Romorantin, a characteristic white grape indigenous to this particular area of the Loire Valley and named after the eponymous village of Romorantin, located about 30 kilometers south of Cheverny and Cour-Cheverny. For the 2007 Cour-Cheverny, the Romorantin grapes were pressed entirely and musts deposited its sediments for 72 hours in underground tanks at 8°C, where they were protected against oxygen by carbon dioxide. Alcoholic fermentation started with natural yeasts between 18°C and 20°C. Malolactic fermentations were made on 50% of the wine, which then rested for 12 months on its fine lees in tanks. To mingle the lees, pump over were made with oxygen to stabilize the wine against oxidation. Cour Cheverny 2007 was bottled in September 2008 with low sulphites (34mg/L) and was kept for 6 months before release because this wine needed time to settle down to be ready to drink. Clear, pale, medium intensity, yellow color with golden reflects. Quite characteristic of the Romorantin grape, the nose is fresh, floral, mineral and nutty, with notes of quince, litchi, eucalyptus, bee wax, honeysuckle, fresh almond and freshly cut yellow hay. The palate is clean, medium to full intensity, fresh, gentle and very well rounded immediately from the attack. The expanding and extensive mid-palate follows with the same round, focus, balanced, and nicely coating attitude, complemented by a great citrus, vivid acidity (yet, it remains soft and silky in a waxy way). Nutty flavors, with a predominance of fresh almond and apricot's skin and seed. The zesty acidity keep this wine in line from being flabby and transport the fruit gently through the lingering finish. At the same time pleasing and intriguing, this excellent Romorantin based wine should interest the adventurous amateurs and connoisseurs, in quest of something different. In conclusion, a small family run Domaine producing natural wines characteristic of their Terroir of origin, vinified the organic way with minimal intervention, no fining, no filtration and barely any use of any preservative like Oxygen or SO2, and no addition of yeasts or enzymes. In short great wines from really healthy vines, produced by nature and environment oriented people who just want to craft the best of their Domaine has to offer. Most info taken from my previous post on Domaine de Montcy (www.ledomduvin.com/2009/07/2007-domaine-de-montcy-cour-cheverny.html) and also from various documents sent to me by Laura herself to produce the Domaine's technical data sheet for Savio Soares portfolio.